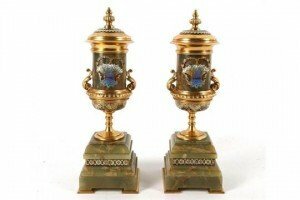 A pair of 20th Century champleve decoration urn garnitures, gilded lids adorning marble cylindrical body with bouquet decoration and stepped base. 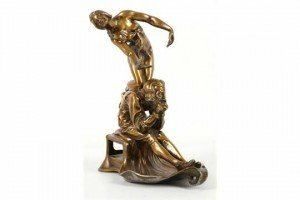 An early 20th Century, bronzed vesta holder, depicting a scholar in thought with a naked female resting on his shoulders, with the facility to hold a carte de visite. 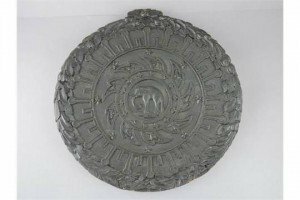 A 20th century Indian circular carved wooded plaque, possibly from a chair back, the centre with an elephant surrounded by stars and a wreath of leaves. 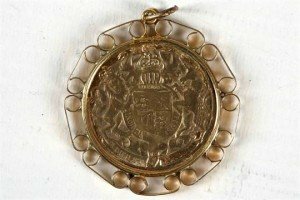 A gold medallion relating to the Royal silver jubilee 1952-1977, Queen’s head right / shield flanked by mythical beast, in a pendant shank. 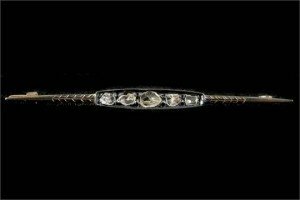 A 19th Century gold bar brooch, centred with five graduated Dutch rose cut stones, flanked by chevron engraving. 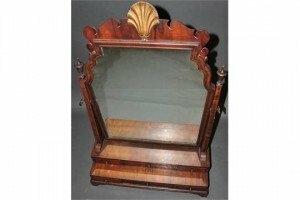 A Queen Anne-style toilet mirror, the fretwork crest with carved scallop shell motif, the stepped base with six drawers. 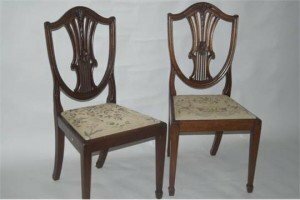 A pair of Edwardian Hepplewhite style mahogany dining chairs, with pierced shield backs, drop in tapestry seats, raised on straight legs and spade feet. 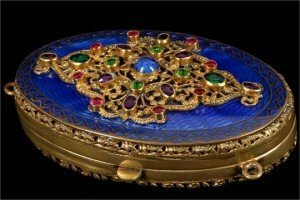 A continental gilt metal and blue guilloche enamelled casket, the hinged lid having applied gilt metal cartouche, with simulated gem stones. 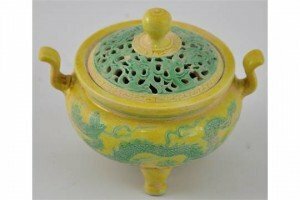 A Chinese yellow glazed lidded incense burner on three feet with two handles, bears six character Chenghua style mark to base. 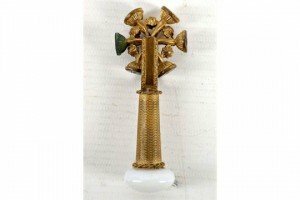 A 19th Century trundle wheel seal, six different seal including thistle, dove of peace, yellow metal grip with opaline button finial. 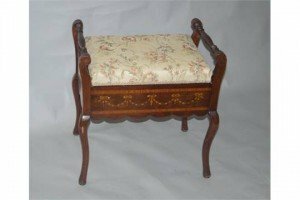 A Victorian mahogany and satinwood cross banded piano stool, with floral upholstered seat, raised on cabriole legs. 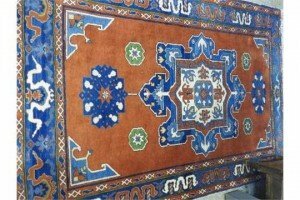 A hand made Heriz rug, the madder ground with central polychrome motif enclosed by stylised indigo border flanked by guard stripes. 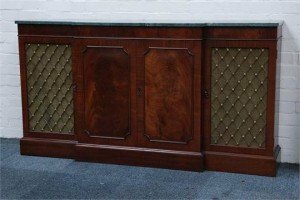 A regency style mahogany breakfront sideboard, green marble top above lattice work cupboards, on a plinth base. 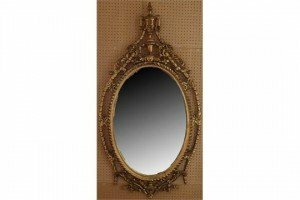 An early 20th Century giltwood mirror, flaming urn surmount, acanthus leaf, trailing bluebell and floral border, rope twist bead. 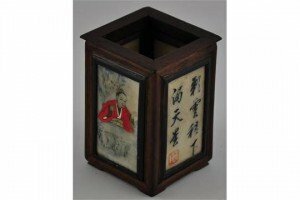 A Japanese hardwood and soapstone brush pot, the hand-painted panels decorated with a figure in an exterior setting, a floral arrangement, and calligraphy. 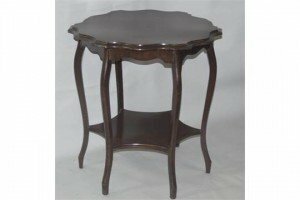 A Victorian oak two tier hexagonal occasional table, with wavy top, raised on six cabriole legs united by a shaped under tier. 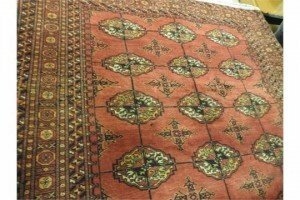 A fine North East Persian Turkoman rug, with repeating tekkeh motifs on a terracotta field within stylised geometrical border. 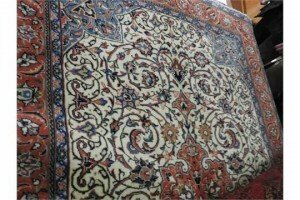 An extremely fine North West Persian Sanouk rug, the central floral pendant with repetitive shah abass spandrels on an ivory field guarded by stylised floral border. 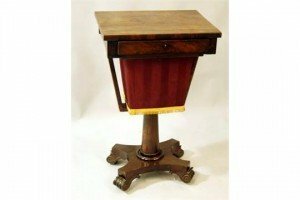 A late Regency rosewood sewing table, with a rectangular top raised above a single fitted drawer and embroidery bag, on a tapering cylindrical support terminating in an inverted platform base with carved scroll feet. 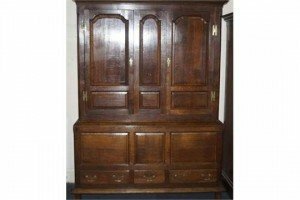 A late 18th Century oak Camarthen cupboard, later converted to a wardrobe, with shield panels, with two doors to top, three false panels to base, and three drawers, raised on a rectangular base and block feet.